During the summer, Pelion is a very special place for holidays as it offers a charming combination of shady forests, picturesque manors, wonderful small or large beaches, water sports or mountain activities and of course delicious local food. The summer in Pelion is season suitable for camping, cool dives and little trips in the surrounding islands of the Pagasetic Gulf. In fact, it is an earthly paradise where everyone has to visit and enjoy the beautiful contrasts in a place which combines sea and mountain. The Mount Pelion charms the visitor with its verdant slopes and the picturesque lovely villages and it can show different and special beauties during the entire year, offering unforgettable vacations. In the summer, the crystal clear beaches, the stylish and very comfortable hotel complexes, the stone-built traditional guest houses and the pleasant dewiness make Pelion one of the most beloved and popular destinations for qualitative holidays. Holidays which offer rest, relaxation and many opportunities for interesting activities especially for the nature lovers with most remarkable the horse-riding in the gorgeous forests of the mountain. Mount Pelion at summer is the ideal season for hiking and naturalist activities, for romantic trips and refreshing walks in the forest while listening the cute chirps of the birds in an idyllic atmosphere. In Pelion there are many beautiful beaches which are unique as you can swim and at the same time to be at the foot of an impressive mountain. The most fascinating for the fanatic visitors of Pelion, are the magnificent sceneries and beautiful beaches that surround it and create the gold combination of mountain and sea, for the best holidays. 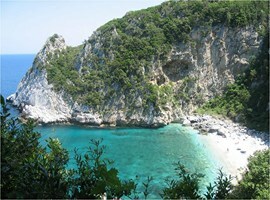 Some of the Pelion beaches look like an advertising poster for an exotic island in the Pacific Ocean. So, here are some of the Pelion beaches. This landscape is a great combination of the green mountain with the deep blue colour of the sea and a really large and clean sand beach. 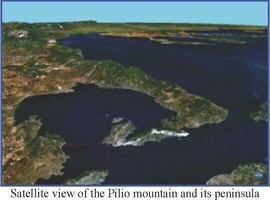 It is 56km away from the city of Volos and it’s a little natural port for small fish crafts. Cool dives in a crystal blue sea and relaxing sunbathing while looking this stunning place and relaxing, are only some of the pleasures you can enjoy there. It’s a beach ideal for families, for groups of good friends and couples and surely can be your retreat from the everyday stress. On the beautiful beach you can find two picturesque and traditional taverns in where are served local tastes with a big smile and a lot of politeness. 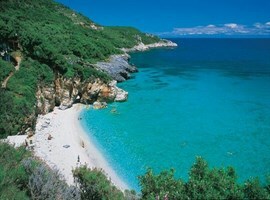 Mylopotamos beach is recognized as one of the most beautiful not only of Pelion but of entire Greece. It is awarded plenty of times with the ‘’Blue Flag’’, but the biggest award is the huge number of visitors every year. Here the little white cobbles make the water crystal clear while also reflecting the impressive green mountain. The beach is cut in the middle by a rock which is offered for climbing and many of the visitors come here especially for this. The beach is full of people during the summer months so if you want to enjoy relaxing holidays is better to visit it in May or September. In the place there are many hotels for all the budgets, traditional guesthouses, mini markets, restaurants and all the necessary facilities for a carefree time. Also, the most adventurous can visit the impressive gorge of Mylopotamos where the camping inside it is free. The bright turquoise of the clear water mingles with the lush vegetation that reaches literally steps to the beach, in between, inserted a golden sandy beach. The beach of Agii Saranda is not greatly organized, but there are umbrellas and sun beds in some parts, but also plenty of space for those who want to enjoy the calm landscape. For the good eaters there are traditional eat houses with tasty titbits combined with local wine or ouzo. There is also a beach bar, hidden in a rock, for those who prefer good company, music and a cool cocktail. 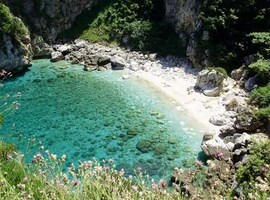 The beach of Kala Nera in the south-western part of Pelion is famous as the most beautiful beach of the Pagasetic Gulf. 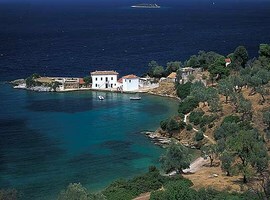 It’s 18km far away from the city of Volos and it’s an ideal destination for both winter and summer vacations. During the summer the visitors have the opportunity to enjoy the view of a stunning, awarded beach with calm and clean waters, golden sand and all the comforts which someone can imagine. Restaurants, beach bars, taverns, entertainment places, markets, watersports are only a few choices of the variety which is offered in this village. For accommodation there are a lot of excellent facilities as hotels, guest rooms and rooms to let with the Pelion hospitality above all. The village of Kala Nera is a fully developed tourist resort while at the same time it’s a gorgeous landscape. The paths which lead to the next villages are ideal for unforgettable experiences of walking and hiking while someone is able to rent a bike or go for riding to the equestrian club of the area. So, in Kala Nera everyone can find everything for successful and pleasant holidays. In the eastern Pelion, close to the famous town of Tsangarada, it’s this unique place, Fakistra. It’s a secluded beach and someone can access it only if leave the car 200 meters away and walk across a beautiful, full of vegetation path. 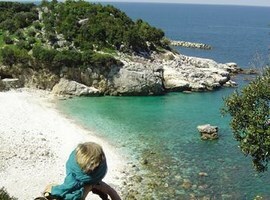 The return might be a little bit tired, however deserves to visit this charming coast. It’s a small gulf, both with sand and white cobbles, framed up by steep rocks. The water is crystal clear and creates a turquoise hue which magnetize your look. But the surprises of the beach do not stop there. On the northern side it’s an impressive cave with stalactites and not far away there is the ‘’secret school’’. This is a chapel carved on a rock which during the Turkish occupation was used as a secret school. And finally, behind the beach, inside the rich and wild verdant, is a gorgeous waterfall. There is no organization with umbrellas, sun beds etc. only a few tables to rest across the path. Who needs these things when the nature so generously gives its gifts? 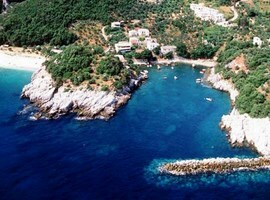 Close to the village of Muressi, there is the little natural port which hosts the beach of Damouhari. There is no full tourist development so it’s an ideal place for the nature lovers, for those who love the outdoors camping and those who prefer the calm and relaxation away from full of people beaches, bars and others. The deep blue waters combined with the white cobbles and the ruins of a medieval castle create a breath-taking scenery which travels you back in time. You can go to Damouhari by car, by sea and also by walking across beautiful paths. In these routes, the visitor can see the irresistible vegetation, the waterfalls, the caves, the wooden or stone little bridges while can rest and drink cool water from the traditional natural fountains. Except hiking or walking, someone can find in Damouhari activities like snorkelling and climbing. Also, near to the water stream, it’s a special place for those who love free camping. Near the beach, there are tourist facilities as hotels and rooms for all the tastes, taverns and stores with all the necessary things may need a holidaymaker. The hospitality of the residents and the beauty of nature can make your holidays simply unforgettable. 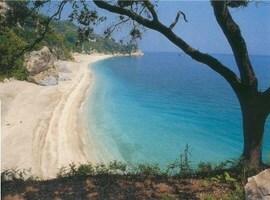 The beach of Agios Ioannis and the surrounding area are the oldest and most famous resort of Pelion. 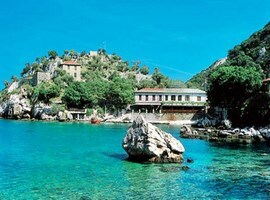 The variety of the offered comforts and the international advertisement of the place attract thousands of tourists every year, confirming the fact that Mount Pelion at summer is a beloved destination. 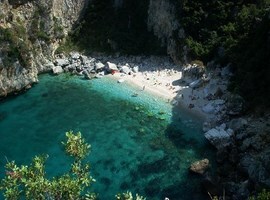 The beach has been awarded many times with the ‘’Blue Flag’’ for its clean waters. The deep blue sea meets the green mountain and mixed up with the colourful roofs of the traditional local houses. The most majestic moment in this place is the sunrise, when the sun comes up from the sea, offering a special experience. Agios Ioannis is a fully organized village with very good quality facilities, restaurants and an intense nightlife, especially during the summer months. Organization, nice routes, exploring, adventures and relaxation create a complete suggestion for summer vacations.